On 22 April, easyJet took delivery of its 250th Airbus – an A320 in a special livery featuring 250 planes. Its first official flight was from the Airbus plant in Hamburg to easyJet’s headquarters at Luton, although it will be based at Gatwick and will mainly fly on routes from there. As with other recent aircraft deliveries, it is equipped with wingtip sharklets: these result in a fuel saving of 4% a seat. The airline currently flies 234 aircraft (approximately two-thirds being A320s and the remainder A319s) on more than 750 routes serving over 130 airports in 33 countries. easyJet is the fourth largest A320 operator and has the third largest order book. Carolyn McCall, easyJet’s CEO, took questions from the media before the handover. Asked about the possibility of product differentiation and more provision for business travellers, she said that the company focused on the requirements of all of its passengers. This had led to the development of business friendly options available to everyone – in particular, to fully flexible fares and the easyJet Plus scheme, offering things like dedicated bag drop, fast track security, priority boarding and an additional cabin bag allowance. She thought that reliability and punctuality were what mattered: on a typical two-hour flight there was no demand for a First or Business Class cabin. She was asked about catch-up moves by legacy carriers – how could easyJet stay ahead? She felt that low-cost carriers had low-cost in their blood and would always pursue efficiencies: legacy carriers had their history and their legacy which meant that they were unlikely to be able to reduce costs in the same way or to the same extent. Her future fleet plan was described as flexible, but she did say that she would be disappointed not to be operating 300 aircraft by 2019. They would mainly be deployed on existing routes, strengthening them and increasing frequencies, but there was also still scope for opening new bases and developing new destinations. easyJet’s recent growth rate had been around 5% a year: Could this continue, and where would the growth come from? She thought that this was well within grasp. 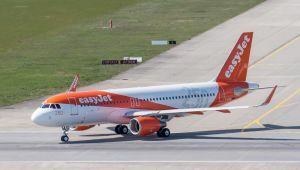 Some growth would come by attracting passengers from legacy carriers – in particular because easyJet used primary airports like Gatwick (although, in response to another question, she repeated her strong support for expansion at Heathrow). There was still much scope to grow the market: there were plenty of opportunities in short haul low-cost – and she did not see easyJet trying to operate long haul low-cost. Airbus had delivered over 600 aircraft in 2014 and plans to increase this number in 2015. The product range is in four families – the A320, A330, A350 and A380. In total, over the years since it was announced in May 1984, Airbus has taken orders for over 11,400 of the A320 family, of which 6,400 have been delivered. Current production is 44 a month, although within two years this should increase to 50.